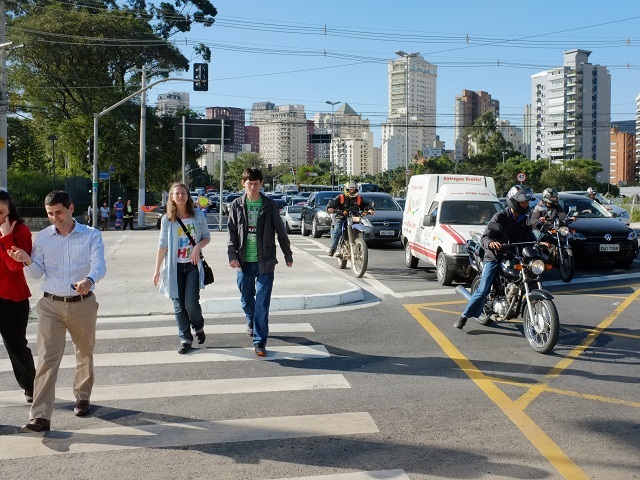 TheCityFix Brazil caught up with José Viegas, Secretary General of the International Transport Forum (ITF), for an exclusive interview on reducing traffic deaths in Brazilian cities after his presentation at the 19th Brazilian Congress of Transport and Traffic held in early October. Photo by Fred Inklaar. Traffic figures in Brazilian cities reflect a real civil war – on average, 109 people die every day and about 1,000 are injured in streets throughout the country. Just this past year, more than 40,000 died and 40 billion dollars were spent by the government. The all-too-often overlooked solution that could spark a radical change in these numbers is political will, as was discussed by José Viegas, Secretary General of the International Transport Forum (ITF) in a presentation during the 19th Brazilian Congress of Transport and Traffic held in Brasilia in early October. Then, TheCityFix Brazil caught up with Viegas for an exclusive interview. During his presentation, Viegas referred to the United Nations’ Decade of Action for Road Safety and its goal of reducing the number of traffic deaths worldwide by 50% by 2020. He also pointed out three major actions necessary to combat this genocide caused by transportation: efforts to combat speeding, punishment for motorists who mix drinking and driving, and encouraging the use of seat belts. What urgent action do we need to curb the number of traffic fatalities? JV: You must emphasize road safety as a national priority. Only then will you get results. However, this requires a strong consensus of politicians at the federal, state, and local level, for this dramatic situation that affects everyone. If you can achieve this, you can be sure that soon there will be resources and the emotional mobilization necessary to combat traffic fatalities. There are studies that detail priority actions to be taken, but the important thing is to raise this issue to the level of priority it requires. What’s the best way to encourage politicians to embrace the cause of road safety? JV: I believe it’s best to show politicians examples of other countries – where they were 10 or 20 years ago, what they did, and how they got to where they are today. If you can demonstrate how the road safety landscape changed due to concrete actions and agreed upon best practices, that’s the best way to motivate action here in Brazil. How do we avoid conflicting measures of the government, such as tax relief for the purchase of cars, at the same time as accomplishing goals of reducing accidents during the Decade of Action for Road Safety? JV: This has happened in many countries. At the time you choose road safety as a priority all measures that may affect that goal need to be revised. So, some decisions need to be revised here in Brazil. There must be systematic and environmental impact studies. Spain and Portugal are good examples of how much it’s possible to change in one decade, even before the UN Decade for Road Safety was launched, since they reduced the number of traffic deaths by around 60% despite a dramatic increase in car sales. This means that it is possible. It’s not only the Japanese or Germans who can achieve road safety – Latinos can do it also! This blog post was originally published in Portuguese on TheCityFix Brazil on October 9, 2013.